Leaked Photo and Details of the Samsung Galaxy Tab S 10.5"
Samsung is planning to launch another series of Tablets and the first one we've seen leaking online so far is a 10.5" Galaxy Tab sporting an AMOLED screen of 2560 x 1600 which is named - 'Samsung Galaxy Tab S 10.5"' in full. The leaked image is just showing the beautiful lock screen and the flat, slim back of the Tablet. Apart from the Samsung Galaxy Tab S 10.5", there are two other tabs which will also be released simultaneously. One is a 8.4″ Tablet while the other is a 13.3″ one. 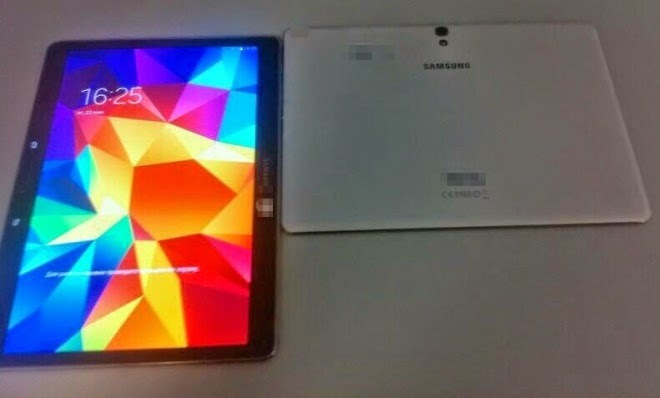 Although the Samsung Galaxy Tab S 10.5" is not yet released or priced but the rumoured likely price tag is €563.90. Well, the Galaxy Tab S series are expected to flaunt an Exynos 5420 SoC with an octa-core processor comprised of four 1.9 GHz Cortex-A5s and four 1.3 GHz Cortex-A7. The Cameras on these Tab S series will likely be an 8 MP and 2.1 MP camera (back and front) while the Android version will be Android KitKat 4.4.2 with Samsung’s Magazine UI. Do you like the wallpaper on the Samsung Galaxy Tab S above ? You can download it here -> Download The Official Samsung Galaxy S5 and Sony Xperia Z2 Wallpapers Free. Watch out for our upcoming post where we will be featuring the new Microsoft Surface Pro 3 and other Tabs. It's better to subscribe to our free mailing list so that you wont miss our upcoming update, don't forget to drop a comment by making use of the comment box at the bottom. Cheers !! !